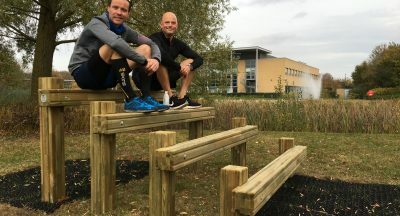 Oxford, UK, November 3 2017 – The Oxford Science Park, home to leading science and technology companies in Oxford, has invested in a fitness trail across the 75-acre site. The five sets of equipment will help promote the health and wellness of employees across the Park and provide a novel way to network at the same time. The trail includes parallel bars, ‘run and leap’ bars, an abs bench, balance beams and equipment for chin-ups. It is spread across the grounds, which include two feature lakes and attractive areas for down-time and collaboration. The accompanying picture shows The Oxford Science Park’s Managing Director Piers Scrimshaw-Wright (L) and Food and Beverage Manager Julien Such (R) trying out the trail. The Oxford Science Park is owned and managed by Magdalen College, Oxford. Created in 1991, the Park upholds the College’s heritage and provides one of the most influential science & technology environments in the UK. There is half a million square feet of workspace accommodation across the Park, which is now home to more than 2,500 people and over 70 businesses. These range from start-ups based in the Magdalen Centre innovation hub to major international companies and include Circassia, IBM, OrganOx, OxSonics, Oxford Nanopore Technologies, Sharp Laboratories, Oxford Genetics, ProImmune and Oxford Technology Management. In addition to being a key property investment, the Park is at the heart of Magdalen College’s strategy to support discovery, innovation and entrepreneurship. It will continue to develop The Oxford Science Park as a long-term strategic asset, with ambitious plans to create an additional 300,000+ sq ft of office and laboratory space on the remaining 10+ acres of land over the next 5 years. This additional capacity will support the growth of businesses already based on the Park, providing flexible workspace accommodation, and enabling new companies to enjoy the Park’s exceptional environment and collegiate and collaborative ethos.